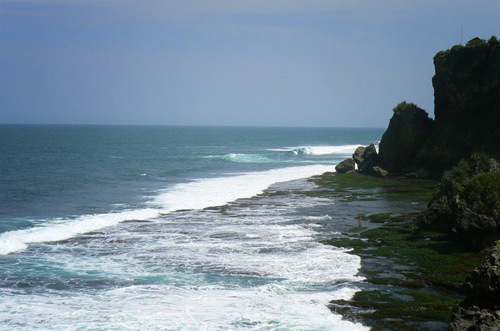 Ngobaran Beach is located at Gunung Kidul region, 50km from Yogyakarta. This is a pure beach with a number of marine attractions to explore. When the tide is low around 3 in the morning, the visitors can join the local fishermen to collect seaweeds or go fishing for stranded fish between the reefs at the beach. The overall panorama creates some unexplainable yet peaceful feelings. Some believe that somewhere in the beach lie the remains of King Brawijaya fort and his men “Sabdo Palon Ngoyogenggong”. Other uniqueness of this beach includes a cave, which leads its explorers to a striking underground stream. Going to Ngrenehan Beach and enjoying the grilled fish will be complete if we drop by Ngobaran Beach that is located adjacent to it. The location of the beach with high cliff is around two kilometers from Ngrenehan Beach. The local people of Ngrenehan Beach even talk and visit Ngobaran Beach. Ngobaran is such an exotic beach. When the seawater had falls, we can see the spread of both green and brown seaweed. When it looked from the top, the spread of the algae growing in coral reef looks like spread of rice field in a densely populated area. Tens of sea animal species also present in between the coral reef, ranging from sea urchin, starfish, to various types of cockleshells.